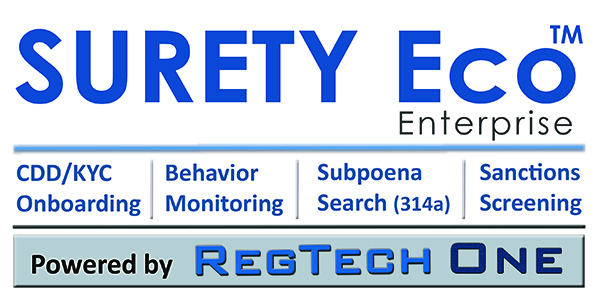 SURETY Eco, an end-to-end BSA/AML Ecosystem, fully integrates CDD/KYC, Behavioral Monitoring with optional FinCEN 314a, and Sanctions Screening. Imagine that for a moment: Your entire Compliance program in a single powerhouse software ecosystem—highly configurable, dashboard-driven, and featuring a comprehensive Query System for cross-module data storage and analytics. AML Partners’ proprietary Cross-Module Query System is the key. With SURETY Eco, you may create any query against any data across all of the base modules of the BSA/AML ecosystem. For example, you might wish to know all customers who have had a false-positive OFAC hit, have had more than 10 false-positive AML cases opened within the last five years, and who are from Colombia. Just query that. Not only will SURETY Eco return the results of that query, but you may choose to run that query as a behavior and direct the system to create a research case when those conditions exist. SURETY Eco is a true leap in BSA/AML Compliance. In stunning contrast to stove-piped, fragmented systems, SURETY Eco delivers single-solution integration of KYC/CDD, Transaction Monitoring, Sanctions and Negative-news Screening, and optional FinCEN 314a/Subpoena Processing. SURETY Eco features dynamic workflow capability; this means that your existing workflow becomes the application’s workflow. During implementation, we will help you replicate your workflow in SURETY’s software ecosystem. And we will teach you how to modify it as your needs change. SURETY’s dynamic workflow gives you full control over your entire BSA/AML AML/CTF software ecosystem. Because SURETY Eco integrates CDD/KYC, Transaction Monitoring, a FinCEN314a option, and Sanctions Screening, your AML/CTF analytics may be as simple or as complex as each individual customer account requires. SURETY Eco’s KYC/CDD module continues to deliver extraordinary functionality and in-house configurability. With SURETY’s trigger-rich Question Management System and customized risk modeling, you can immediately comply with all current laws and rules. And with SURETY Eco, the KYC/CDD module now automatically initiates the lifecycle relationship-management phase by integrating automatic ongoing due diligence (ODD) on every accepted customer. SURETY Eco also integrates its transaction-monitoring system, which we call Behavioral Monitoring. We include pre-configured behaviors that you may choose to run. And you may also choose to create your own through the advanced Cross-module Query System; this greatly extends your capability to monitor other modules and behaviors not predefined in order to determine truly suspicious activity. For example, using the integrated modules, you might choose to flag all transactions over a million dollars for customers headquartered in Saudi Arabia who are in the arms industry and have had a negative-news hit. You may configure the system to run that query on any schedule you wish, and you may choose to create research cases based on your perceptions of possible suspicious activity. SURETY Eco can also automatically generate CTRs and populate most of the information for the SARs, and SURETY Eco also gives you the ability to create your own case management system within the behavioral monitoring module—you decide who sees and does what and when. You also have the option of adding to your Behavioral Monitoring a fully integrated 314a subpoena-search system that conducts a fully encrypted workflow-based fuzzy-logic search of the two FinCEN lists. Data is fully encrypted from the time you upload each FinCEN list. Only those two individuals registered in FinCEN and registered in SURETY Eco may see any of the data, determine whether there are false positives, or grab the transactions for true hits. All that functionality exists—within the 314a module as a part of the SURETY ecosystem. The last piece of the AML/CTF puzzle is SURETY Sanctions Screening. SURETY Eco includes fully integrated, automatic download of both the sanctions and non-sanctions lists from OFAC. SURETY’s Sanctions Screening also provides you the option of turning off or on the scanning of “weak a.k.a.” from OFAC. You may also choose to add additional data-service subscriptions for enhanced sanctions lists. You may also submit your own lists—for example, employees and vendors—to be screened automatically. SURETY Eco delivers in-house control and customization in a user-friendly interface. Each user may configure a custom dashboard in order to track progress and data analytics. And our commitment to “Comply on the Fly” technology means that authorized Compliance users may instantly adjust risk models, data-collection details, and so on. And accessing advanced analytics is as easy as making a query, the results of which are delivered to authorized users. Compliance officers will also appreciate the fully configurable user-based permissions system. With SURETY Eco, the authorized Compliance user determines who may edit or view what and when. For instance, the system may be configured to send automated emails to IT when an error condition exists in any log. SURETY Eco will also monitor other system logs if you so desire. SURETY Eco also includes an advanced and fully configurable email notification system so that users are notified when they are required to take action. For example, designated users would get an automated email when a file needs periodic review or any other action. Moreover, as with everything within SURETY Eco, every keystroke is audited. Every user action—the who, what, and when—is logged and available for review by authorized users; and SURETY Eco will even show you how each change compares to the prior entry. With SURETY Eco, user accountability is both transparent and verifiable at all times. The stakes are high and getting higher for AML Compliance. SURETY Eco will transform your efficiency and effectiveness as it puts an entire BSA/AML ecosystem and all its critical data at your fingertips. Contact us today to get more information and to schedule an Eco demonstration.